Optimism among Catalans after Sunday's vote should not disguise the significant challenges ahead if anything is to come from their "non-referendum consultation". Demotix/Rosa Maria Duaso. Some rights reserved. First of all, let’s look at the facts. On November 9, an important cross-section of Catalan society went to vote. Was it a referendum? Or was it –as the Catalan government insisted – a “non-referendum consultation”? Technically it was neither. Instead, it was a kind of peaceful manifestation, a massive civic ceremony symbolically consisting of putting ballots inside of boxes. It did not meet even the most basic standards of an official referendum. It had no legal basis (and in fact had been suspended by Spain’s constitutional court), no list of registered voters, no impartial staff at voting booths, no legally bound electoral management bodies etc... If this were not enough, we found out on Monday that some voting venues would be open until....the end of the month! No this was something different: an original, massive, protest event. As such, it was highly successful, regardless of what the Spanish government says. They seem to be sticking to the ostrich’s approach. What do the results say? What about the numbers? Assuming that the figures given by the organisers are accurate, then around 2,250,000 people have voted. There were about 5,400,000 people on the list of registered voters in the last election in 2012. But in this “informal referendum”, sixteen and seventeen year olds could vote as well as non-Spanish immigrants. Taking this into account, the theoretical list of “registered” voters rises to around 6,250,000 people. Given these figures, it seems that only around 33 percent of people voted. Sure, lots of people took part, but it was still just a third of possible voters, much less than the usual turnout of between 56 and 66 percent in Catalan regional elections. But still, had there been a turnout of 65% say, voters supporting independence would still not have reached 50% of the total. Let’s not forget that around 80 percent of voters, around 1.7 million people, said yes to independence. The other 20 percent voted no or submitted a blank vote. Since there will never be a legal referendum condoned by Madrid, and given that it is not possible to expect a unilateral one, we only have the regional elections left. And in that situation, competition between parties will fragment those who support independence. Why? Because in reality, those parties that supported the referendum are divided about the heart of the matter. Two of them (ERC and CUP) want a unilateral declaration of independence, and the others – led by Catalan president Artur Mas – will not do so. As a result, we arrive back at two essential aspects of democratic politics: competition among parties (divisive by definition) and the question of how to take politics to the institutions. 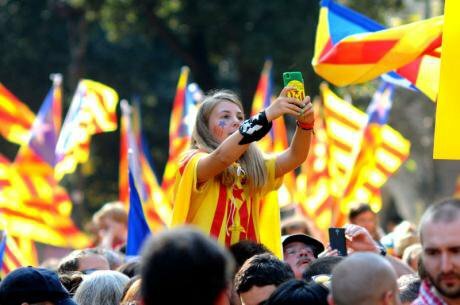 In the last few months, what exactly is going on in Catalonia has been attracting a large amount of attention. The dichotomy between “political” and “legal” has been at the forefront of this debate. “This is not a legal matter, but a political matter,” say many Catalans. “This is not a political matter, but a legal matter,” says Madrid. Is this true? While the Spanish government has doggedly maintained a narrow-minded and antagonistic attitude, the problem is legalistic at heart. The referendum is illegal and must be prohibited, unless we have a constitutional reform. In the meantime the Spanish government cannot sanction an illegal act – that would open up so many slippery slopes. But let’s look closer at this political/legal conflict. In a legal system like ours (I speak of Catalonia, Spain and Europe), politics and law are inseparably bound. When there is a problem, so to speak, the government and institutions use the law courts to justify their actions. The accusation that the Spanish constitutional court has been politicised is a long-standing one. It is argued that the way it appoints its justices is too political, although in Spain this is true of every institution (state, region, municipal), because dominant political parties (whoever they are) tend to want to control all democratic institutions and resources. In the event that concerns us however, the problem is different. The Generalitat of Catalonia, (which is above both the Catalan government and regional parliament) have made contradictory gestures. On the one hand, it urged the constitutional court to quickly decide about the suspension of Catalonia’s planned referendum. However, the body forgot that there are a few legal steps before this. For example, the constitutional court must wait for arguments from all of the concerned Catalan bodies. This caused a delay in the court’s pronouncement, as they had to wait for arguments from other bodies. Furthermore, the Catalan government appealed to the Supreme Court, which has no jurisdiction over the constitutional court. Every first-year law student could tell you this, so why did the Catalan government do it? In order to blur the lines between legal process and political willpower. I believe they are trying to show the ability of politics to cope with problems that the law cannot, and that they tried to counteract the weakness in the law by using political maneuvering. This is a big mistake because from this point, one must consider the factor of time. For two long years, some politicians believed that with a good communications team and the support of the media and civil society (including at least four huge demonstrations of popular strength), it could conceal the evidence that the legal battle was lost from the beginning. When time seemed a luxury, the game was easy to play. But the holiday is coming to an end and time is speeding up. Soon all will realise the ugly truth: politics has only stalled the law, and the law is, in the end, the legal way to express political agreements. Despite the big success of the civic mobilisation on November 9, political parties belonging to the sovereigntist front, and Mas, the leader of the primary one, know that in the end, they will either achieve an agreement with Madrid (unlikely), which will not be much different to their current ‘brick wall’ policy, or they will not get anything at all. In other words, nothing will really happen. Frustration among the people will increase, but no political solution will materialise. What the movement has achieved in the streets must be taken to the institutions. Otherwise, Catalans will just replace their feelings of elation with feelings of self-pity. In reality, this is not just a problem for Catalonia and the Catalans. It is just a part of the structural crisis, never seen before, which is affecting the whole Spanish political system, starting with its territorial structure and concluding with the trust between citizens and political elite.